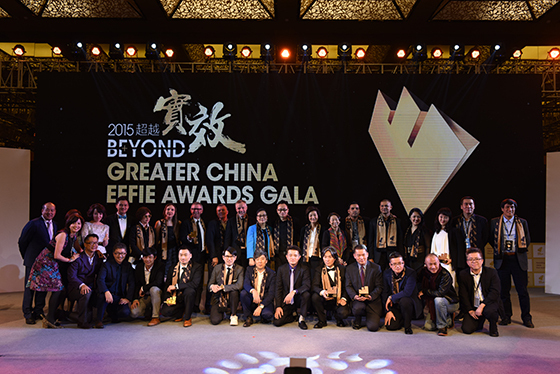 The 2015 Effie Awards China Gala took place at the Qujiang International Conference Center in Xi’an, one of China’s ancient capital cities, on Sunday October 25. It was part of the annual festival, which gathered over 700 advertising and marketing professionals. Among the attendants to the Effie Awards Gala were the heads of the China Advertising Association, Effie Worldwide, Effie New Zealand, Effie Malaysia, Effie Korea, Effie Sri Lanka, APAC Effie, and Effie Hong Kong. . In total, 121 effective cases were awarded. The Grand Effie Trophy was presented to Blue Focus Digital and Baidu for their case, “See you again, Katmandu.” The Grand Effie trophy was presented by Mr. Neal Davies, President & CEO of Effie Worldwide, and Mr. Yang Hongfeng, Chairman of China Advertising Association, at the pinnacle of the gala. The winners in 24 products and service categories and 17 specialty categories were awarded . For more information on Effie Greater China’s 2015 Festival, please visit Effie Greater China’s website.